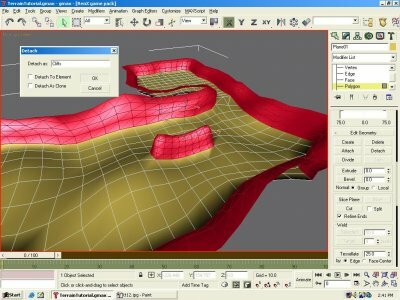 Creating terrain seems like a cumbersome job is you envision aligning planes and boxes only to yield flat ground and blocky mountains, but if you know how to use Max properly, it can be done neatly and in a relatively short amount of time. Note however that this only covers the basics of creating the terrain meshes, nothing advanced. 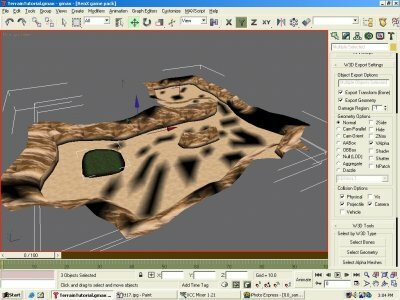 When you create a C&C mode map, you`ll need to align the buildings with the terrain. I also am assuming you know how to navigate gMax, and how to do apply basic textures. Texturing tutorials are aplenty. Start off by creating a plane. 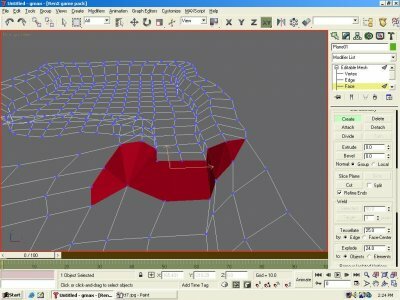 Convert it to an editable mesh (right click) and drag the edge vertices around using soft selection (found by expanding its tab under Editable Mesh. Round it out a bit to form the base ground. 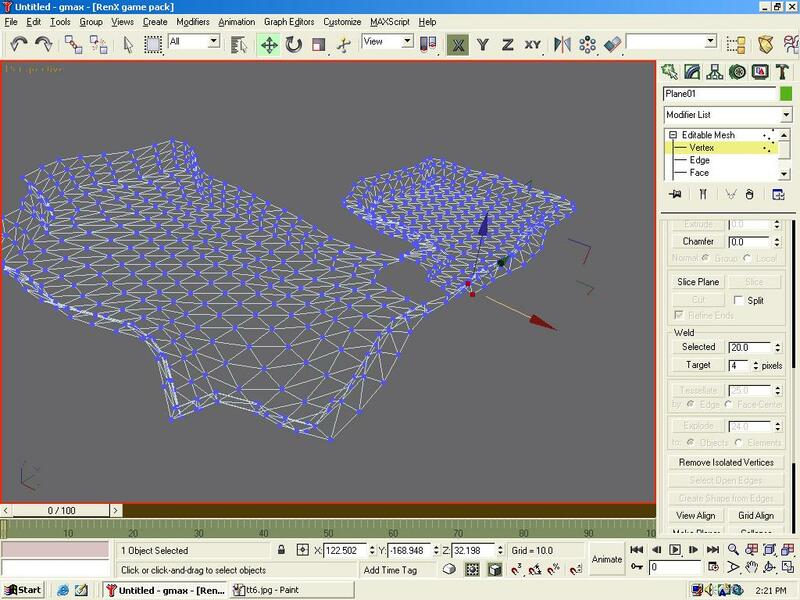 Select the outer edges of the mesh. Scroll down to Extrude on the sidebar and set the value to 0.00000001 or similar to keep the extrusion from going anywhere. Hit the Extrude button, and drag the edges vertically. Hit it again, and repeat. Note: a much faster and better method for extruding is to move your mouse above the Z arrow, hold shift and drag that Z arrow/axis upwards. Use the scale tool to make the edges curve outward (mouse over the Z arrow/axis when scaling outward). Do this one or two more times until the edges cannot be seen from the ground below (by the players). If you don`t have one already, create an opening by deleting some polygons (select them and hit delete on your keyboard.) Drag a few of the vertices to make an outer angle. 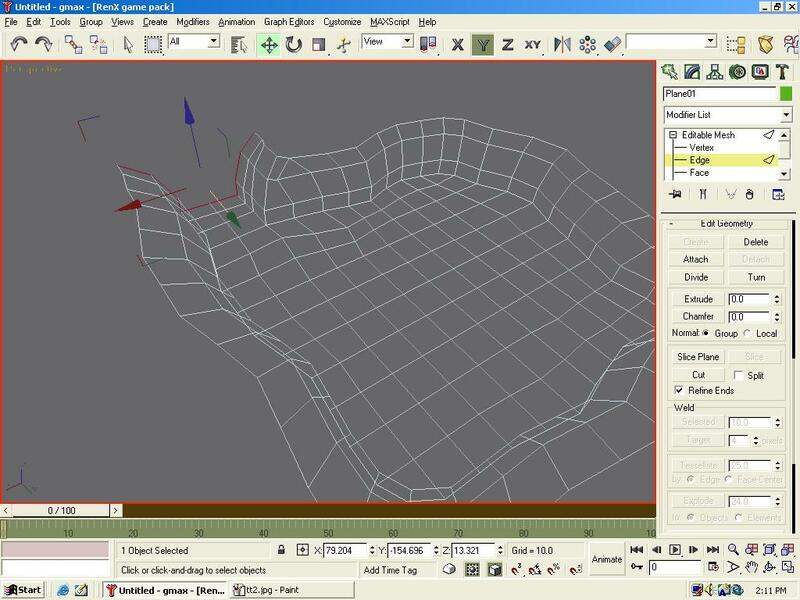 Now select the edges on the opening and extrude some more to create an exit to the area. Now create a larger plane, which you will make into the main area of the map. Attach the meshes together using editable mesh. Shape the new plane into more terrain using soft selection on the edge vertices and extruding some more. Now it`s time to connect the two objects together with polygons. Select vertices that are relatively close to each other and in the Weld box, set the value next to Selected to however many meters from each other you estimate the vertices are distant. Hit the "Selected" button, and they should weld. If you get an error, increase the value. 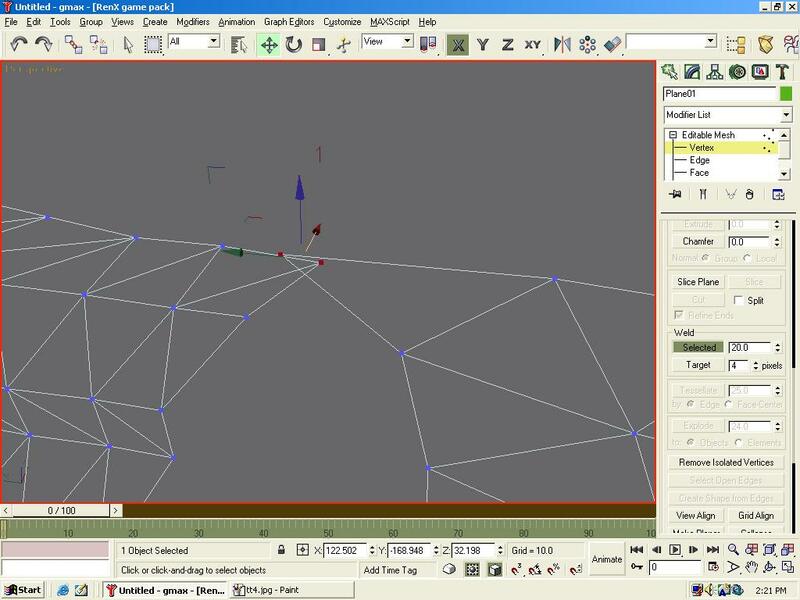 Hit the Face branch on the Editable Mesh tree and hit the Create button. Build face by clicking on three vertices consecutively in Counter-Clockwise order. Hitting them clockwise will build a backface. Build more faces to completely connect the objects. If you switch your view to smooth + highlights, you`ll notices that your level will be very faceted and blocky looking. Remedy this by selecting all the faces and scrolling down to the Auto Smooth button. Set the value to 180 and click it. I have changed my terrain's color to look more like a desert. This is not the texture though and is merely for my myself during the modeling process. Now, use soft selection to drag vertices smoothly on your mountains and ground to give the terrain a more realistic shape. 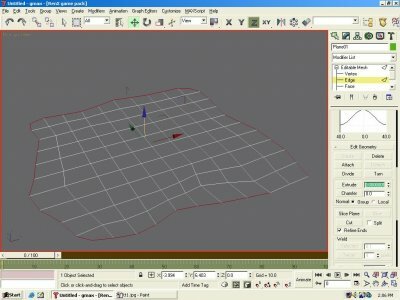 When you move a vertex with soft selection on, gmax/max will automatically also move the surrounding vertexes by a certain amount toward the same direction. The amount is merely indicated by colors on every vertex and can be controlled by Falloff, Pinch and Bubble. 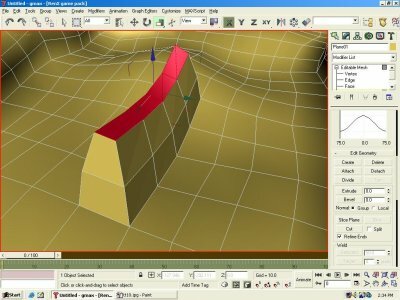 Aircraftkiller taught me an easy technique for creating ridges. 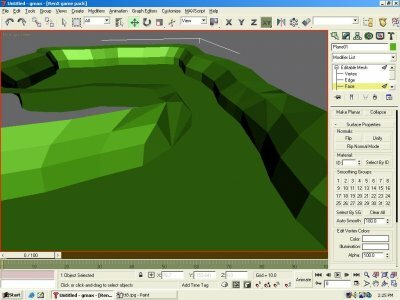 Select a few of your ground polygons and extrude them up a couple times scaling them down a bit each time to give the ridge a tapered look. 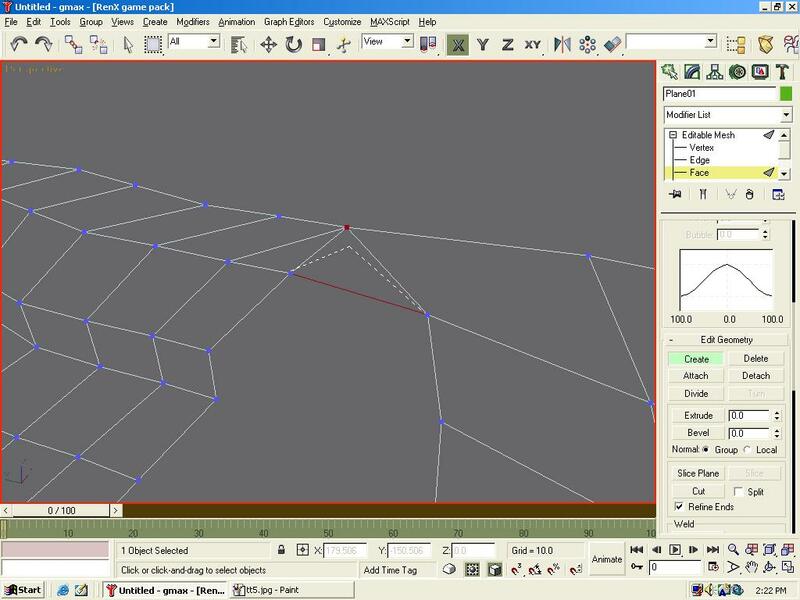 Now, select all the polygons that make up the ridge and find the Tessellate button. Leave it as Edge and 25, and just hit the button. 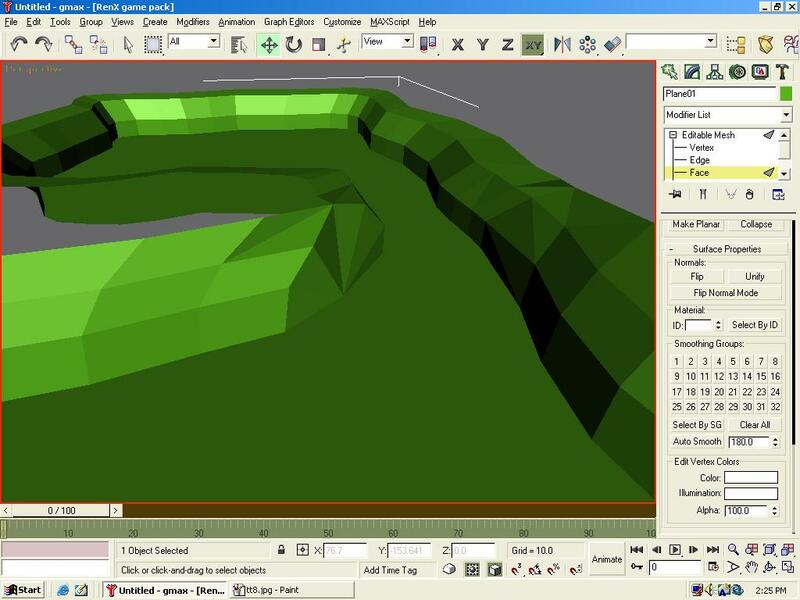 It will smooth out the ridge with more polygons. Again, you need to run the Auto Smooth on your terrain. Now it`s time to divide up your meshes. Select the mountain polygons. I selected mine by going to the front view and selecting the higher polygons. Clean up by holding down the Ctrl key on your keyboard and selecting/deselecting polygons my clicking on them. Hit the detach button on the sidebar, name it, and hit OK. 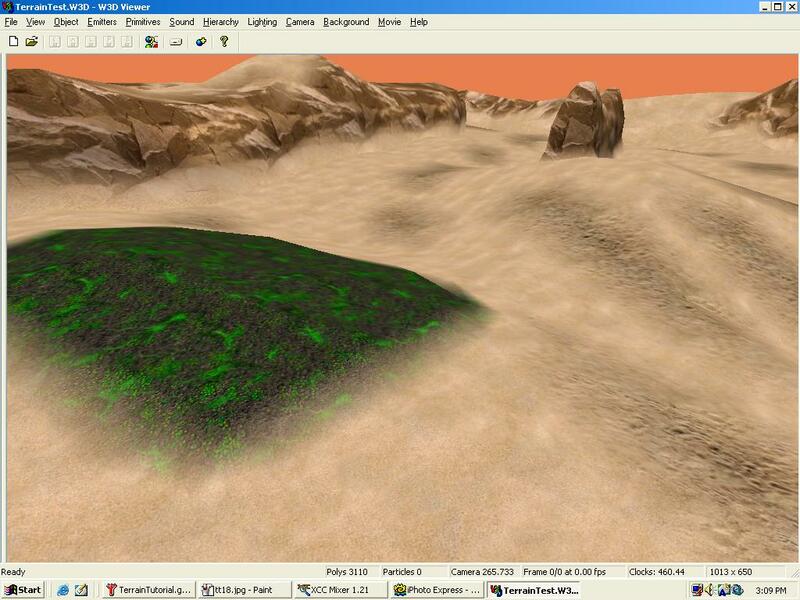 If you want to make a tiberium field, select a few polygons, Tessellate them with a value of 0 this time. Move the vertices around to give the tiberium a boarder, which will be the blending area. Detach it as you did the mountains. Now, set up your materials with 2-passes. Pass one should be the texture you want blended onto the main texture. Don`t hit display on the texture until you have both passes set-up, or RenX will crash. Pass 2 will be the main texture. 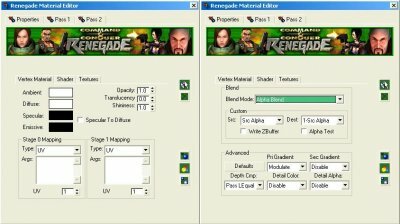 Set its Ambient and Diffuse settings to white, and its blend mode to Alpha Blend. Apply the materials and texture accordingly. You`ll want to have display set up on the second pass to all your materials. 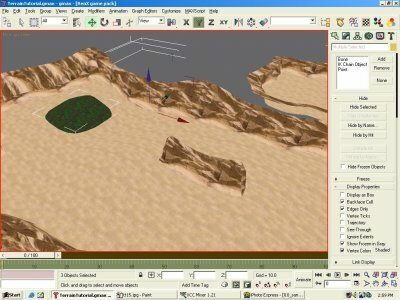 I have 3 materials: Cliffs, Sand, and Tiberium. The Cliffs and Tiberium you`ll want to have a sand texture on their first pass, so that you can blend them seamlessly into the ground. 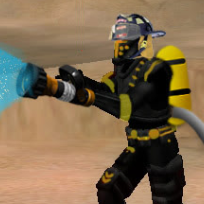 For pass 1 on sand, I have an alternate sand texture. I`ll use blending to eliminate the monotony of a single ground texture. Now, go to the display tab on the sidebar. 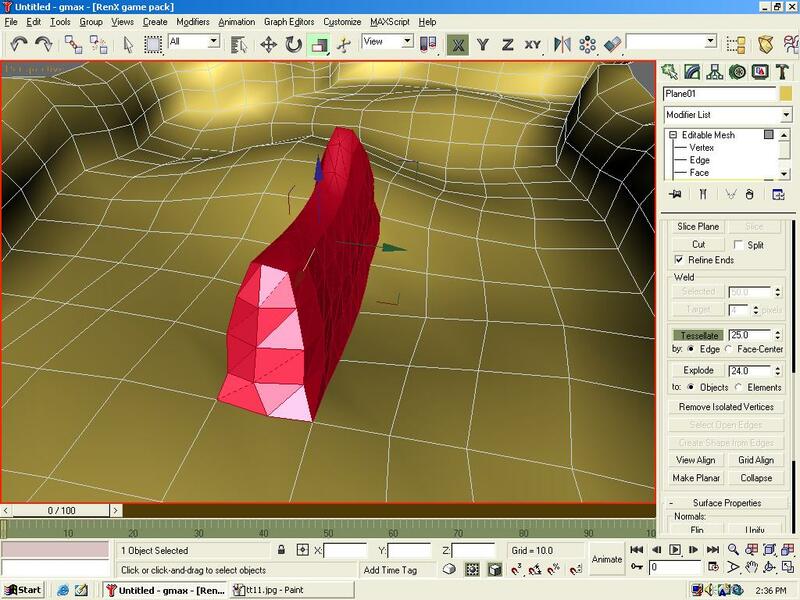 Select all the objects and put a check by Vertex Colors. 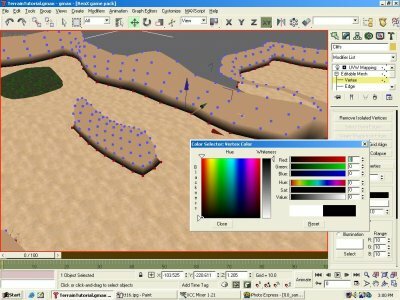 Select the vertices that you want the blended texture to appear on, and change their colors to black using editable mesh. First make sure to have all the verts bordering the ground black, then you can select random verts to prevent a tiled look. 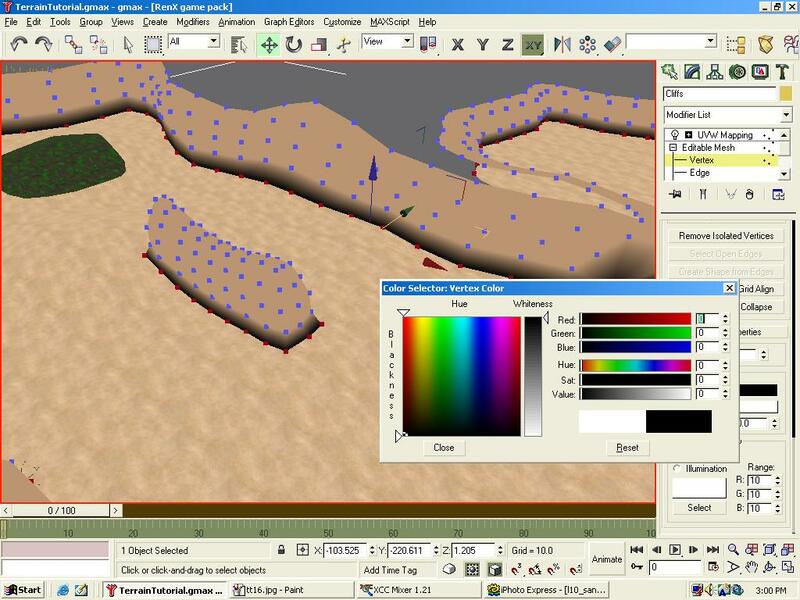 When you`re done playing with vertex colors, select all the objects and mark your collision options. 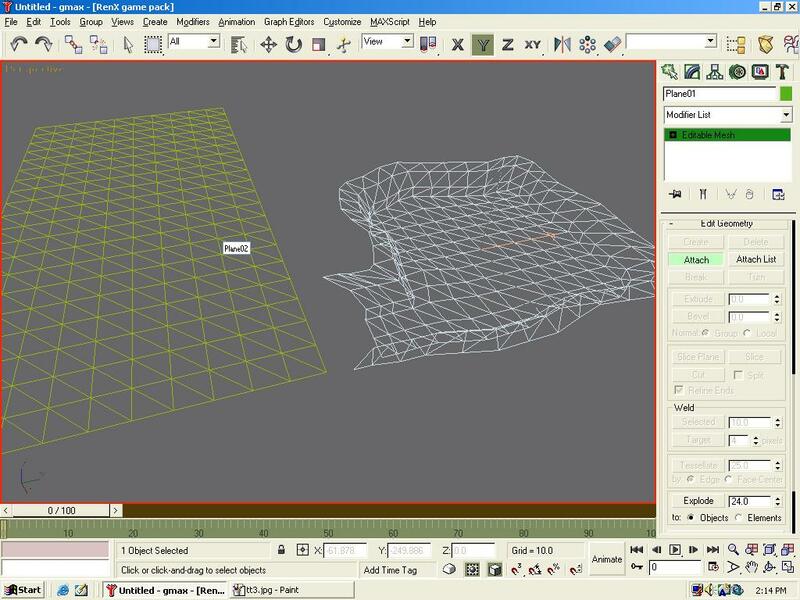 Check the Valpha box under the W3D export options to tell the W3D engine to blend the meshes. Export to W3D, and take a look at it in W3D Viewer. If you have meshes that didn`t blend, make sure you have it`s blending mode set to alpha blend, and VAlpha is marked. 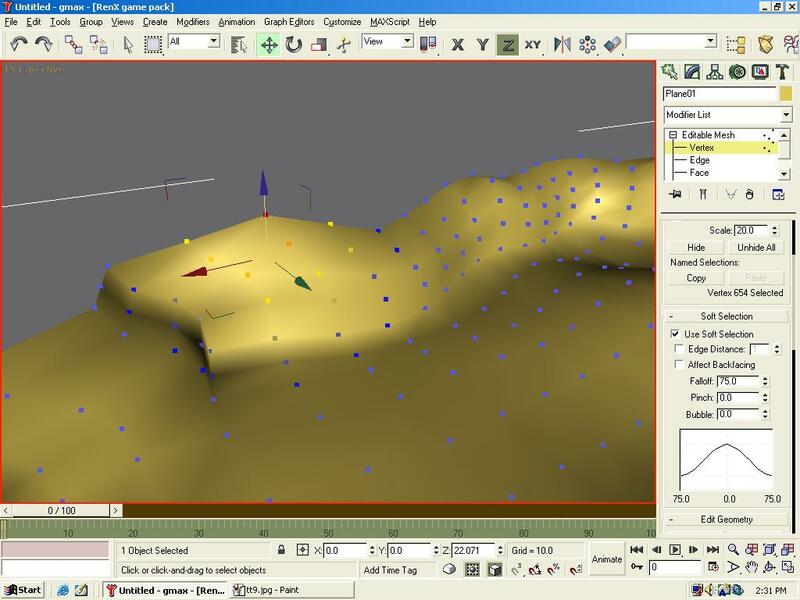 If no errors exist, then you should have some nice looking terrain!